The Pentek US-1500 is an undersink water filtration system. The Pentek US-1500 uses any of the following water filter cartridge sets: D-250, D-250A, P-250, P-250A. The Pentek US-1500 features an Electric Monitor that the Pentek US-1000 does not have. The monitor electronically tracks your water usage and reminds you when it is time to change your filters. The Pentek US-1500 Chemical/Lead System is NSF certified to reduce 43 different VOCs, lead, cysts, mercury, asbestos and chlorine taste & odor. The US-1500 systems comes complete with cartridges, a long reach faucet, and installation hardware. The Pentek US-1500 water filter system replaces the Culligan SY-2650 system. The parts and replacement filters are the same. The Pentek US-1500 under sink filters should be replaced every 500 gallons with MTBE reduction or every 1000 gallons without MTBE reduction. 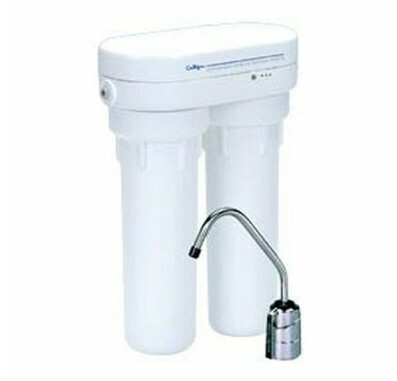 The recommended water filter replacement for the Pentek US-1500 is the P-250. This filter set does not remove MTBE. To remove MTBE, purchase the P-250A. Other compatible replacement filters are the Culligan D-250 and the Culligan D-250A.